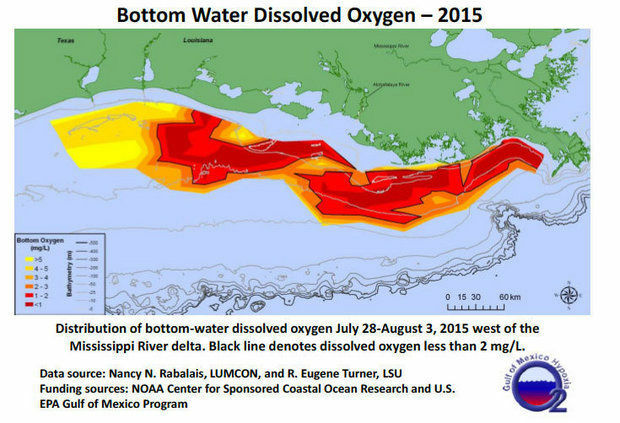 Each year, scientists in the northern Gulf of Mexico measure the size of the “dead zone,” which is an area where the bottom waters contain oxygen levels below 2.0 mL oxygen per L of water. This is a commonly identified threshold below which many zooplankton and fishes cannot survive. The states along the Gulf of Mexico rely on productive coastal fisheries, and for bottom associated species like shrimp and crabs, a larger “dead zone” means less habitat. This year’s dead zone is exceptionally large (6,400 square miles), leading many people to believe that something or someone is to blame. In reality, there are many interacting factors that cause the large dead zone. To understand why the dead zone is so large, we must first understand why it forms. The dead zone has been forming in the Gulf of Mexico for centuries, but only in the last few decades has the dead zone dramatically increased in size and severity of hypoxia (low oxygen conditions). For a dead zone to form, two basic conditions have to be met: 1) there must be high freshwater runoff through river input (a supply of nutrients), and 2) there must be strong thermal stratification. During the summer months, the southeastern USA experiences high amounts of rainfall, which leads to increased river flow into the Gulf of Mexico. The summers are also extremely hot, so the sun’s radiation heats the surface layers of water more than the deeper layers. This thermal heating suppresses vertical mixing, which makes it difficult for the deeper waters near the bottom to re-equilibrate with the atmosphere. When the freshwater enters the Gulf of Mexico, it supplies nutrients to the phytoplankton, leading to a bloom where they take up carbon dioxide for photosynthesis and produce oxygen. These phytoplankton, however, have short life spans (~2-4 weeks), so they die shortly after the bloom. When the phytoplankton die, they sink to the bottom of the Gulf of Mexico and are then broken down by bacteria. These bacteria use the available oxygen in the deeper waters to break down the dead phytoplankton, ultimately leading to hypoxic conditions and the formation of a “dead zone.” The intense summer sun suppresses the vertical mixing by keeping the surface waters much hotter than the low oxygen bottom waters. Large storms or wind events (i.e., hurricanes) can actually reduce the size of the dead zone because the winds promote mixing of the water column, allowing the low oxygen bottom waters to reach the air-sea interface and once again become saturated with oxygen. So why is the dead zone so large in 2015? For one, we are experiencing an extremely strong el Nino year. For the southeast USA, el Nino leads to high amounts of rainfall but poor conditions for hurricanes due to wind shear in the upper atmosphere. The combination of high rainfall but few hurricanes is favorable for a large dead zone. The consistently large dead zone documented in recent years appears to be predominantly due to farming practices that rely on large amounts of fertilizers, which ultimately end up in the rivers feeding into the Mississippi River and Gulf of Mexico. Because most of our gasoline now contains ~10% corn-derived ethanol, there is currently a huge incentive for farmers to grow corn. The problem is that corn is a crop that requires large amounts of nitrogen-based fertilizers that eventually end up in the Gulf of Mexico, providing fuel for the phytoplankton blooms that cause hypoxia. There is also some evidence that the Gulf of Mexico may have experienced a regime shift in the plankton and microbial communities that make the ecosystem more responsive to nutrient input changes (Dale et al. 2010). The problem of the Gulf of Mexico dead zone is a perfect illustration of how oceanography is souch an interdisciplinary science. To understand why and how the dead zone forms, we must consider physics, climatology, biology, and even public policy which influences nutrient supply into our rivers. Fixing the problem of the Gulf of Mexico dead zone will require cooperation among many different interest groups, but some of the factors that influence the size of the dead zone are out of our control. 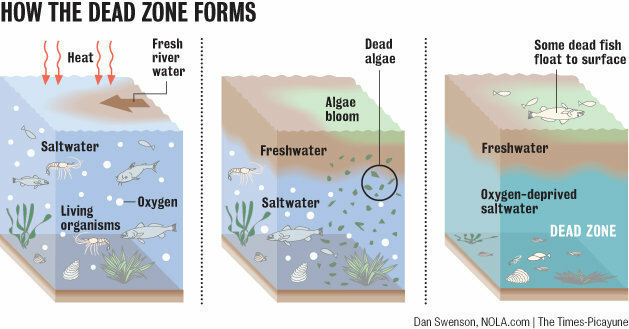 Substantially reducing nutrient runoff into our rivers is an achievable goal that could help alleviate the stress on the ecosystem by reducing the size of the dead zone. Dale, V.H., Kling, C.L., Meyer, J.L, et al. (2010) Hypoxia in the Northern Gulf of Mexico. Springer. New York. 284 pp.